The Drill cup at the 2009 Reunion. In the Autumn of 2006, I awoke on a golden October morning with memories of my days at RAF Bridgnorth when 10 Flt. 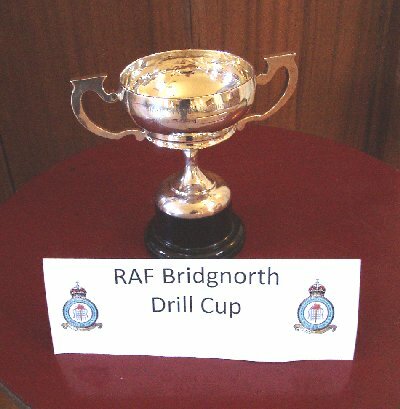 'A' Squadron won the Station Drill Cup. I had been part of the winning team and now felt well qualified to search for it. I set myself this task and I was convinced that it would not take long to trace, but I deluded myself as this account will tell. I began publicising my quest with the help of the Shropshire Star. A reporter kindly gave my tale a nudge start and following her report I received my first response from a retired Wg. Cdr. living in Telford who assured me that the RAF didn't get rid of silverware that readily and that it had probably been stored in a Maintenance Unit. His guess was Quedgeley but I could make no contact with the MU and found out later that the site was being sold for housing development. When Bridgnorth closed for business in 1963 the Stanmore site was auctioned off by the local firm of Nock Deighton. I felt sure that they could provide an answer to the question of the lost trophy. One of their senior staff telephoned to explain that the firm had the task of site clearance only, with no brief for selling the contents of the camp. However, he very kindly thought my quest was newsworthy and passed my name to a reporter on the Bridgnorth Journal who promptly rang me for the story. A Wolverhampton reader followed up with a telephone call and words of encouragement, suggesting that I make appeals through various web sites, one of which proved very useful - the RAF Police site. From that site, I learned, from an ex-Provo, that the cup had been moved to Swinderby (the successor to Bridgnorth for basic training). Despite the knowledge that Swinderby closed within the last twenty years my hopes were raised and, I felt that the cup still existed. My hopes were dashed however; when I learned, from the same source, about the theft of silverware that had taken place at military base in the South of England. To avoid incrimination the thieves had dumped much of the haul in the Thames. The likelihood being that my trophy was amongst those items. By now, after chasing so many false trails, I began to tire, but I held on to the belief that it was still to be found. Little did I know that a chance visit to the RAF Museum at Hendon in April this year would bring me closer to tracking my prize. On that visit some paintings attracted my attention and on my return home I was a prompted to write a letter to ask for information about the artist. In my letter I asked an additional question as to how I could trace the lost trophy. The Keeper of Research very kindly directed me to the MOD suggesting that I put a question to them within the terms of the Freedom of Information Act. Within days I had a reply to say that the cup had been found and was stored at RAF Halton. His task now done, my informant at the MOD directed further enquiries to Halton where the Deputy Chief of Staff, Sqdn Ldr S G Williams showed sympathetic response to my request for the cup to be released in time for the Cosford Parade and the Bridgnorth re-union. With restored spirits I reflected on a quotation from the book of Ecclesiastes in the Old Testament, "To everything there is a season, and a time under heaven. A time to weep and a time to laugh, a time to mourn and a time to dance". Now, after two and a half years of researching in excess of thirty possible sources for help, I consider that time has come.